Positron emission tomography (PET) has been playing key role in important clinical decision-making in many areas ever since its inception in the field of medical imaging. Most of the hospitals are enthusiastic for including PET in their imaging services because of its increasing application particularly in oncology. However, the occupational workers are apprehensive about the risk of higher radiation exposure in a PET facility. There is a need therefore to make the staff aware of the radiation doses they may likely get while working in this facility. We have estimated the radiation exposure to the physicians and technologists working in our PET/CT facility based on the dose rate measurement with calibrated survey meter and pocket dosimeter. The mean dose measured at the chest level per PET/CT procedure was 3.24 μSv and 0.62 μSv for the physicians and technologists respectively. The mean dose to the physicians per MBq of 18F-FDG injected was 8.76 nSv/MBq and 27.68 nSv/MBq at the chest and wrist levels respectively. Early diagnosis or exclusion of infection/inflammation is of utmost importance for the optimal management of patients with infection/inflammation. Currently available imaging modalities such as computed tomography (CT) and magnetic resonance imaging (MRI) provide excellent structural resolution for changes related to infection and inflammation disorders. However these modalities are of limited value in detecting early metabolic changes that occur in disease processes. 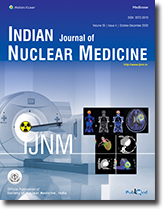 Various functional nuclear medicine techniques, like labeled leukocyte imaging, Gallium scan, bone scan etc. have been tried in last three decades with variable success. Whole body imaging with FDG-PET for the diagnosis, staging, monitoring response to treatment, and detecting recurrent malignant diseases has been well established. The introduction of PET-CT has added a major dimension to FDG-PET imaging. In spite of great successes achieved by FDG-PET imaging in the evaluation of malignant disorders, the test is not specific for cancer. Soon after the introduction of FDG-PET for human studies, it was noted that lesions with substantial inflammatory cells also appears positive on FDG-PET. Benign processes such as infection, inflammation, and granulomatous diseases appear to have increased glycolysis and are therefore readily visualized by FDG-PET imaging. Therefore, the role of FDG-PET could be further enhanced in situations where, infection and inflammation is the focus of the investigation. In the present review we will discuss the various indications where FDG-PET can be useful.